Ernest Gatehouse was born in 1892 in Yeovil, the son of harness maker Frank Gatehouse (1856-1928), originally from Shaftesbury, Dorset, and Jane née Hallett (1854-1930), originally from Seavington. Frank and Jane had moved around a bit during their marriage; their first child was born in Yeovil, the next three were born in Martock and the last three, including Ernest, were born in Yeovil. The 1901 census listed the family at 2 Brunswick Street (see photo below); Frank and Jane's children were Cecil Frank (1886-1951), Kate Marina (1887-1960), William Raymond (1889-1949), Maud Phelps (1891-1954), Ernest (1892-1918), George (1895-1953) and Sidney James (1899-1954). Their last son, Wilfred Harry (1904-1992), was born after the census. The family were still at the same address in the 1911 census by which time 18-year old Ernest described his occupation as a Printer's Apprentice. He worked at the Western Chronicle office in Middle Street. It is not known when Ernest enlisted, but he enlisted at Poole, Dorset. It was probably during 1915 or 1916 judging by his Service Number 25715. He joined the 1st (Regular) Battalion of the Hampshire Regiment. The Battalion was part of 4th Division and had been in France since August 1914 as part of the British Expeditionary Force (BEF) and almost immediately entered a series of battles. Since it is not known when Ernest joined the Battalion it is not known in which of the earlier battles he took part. However he was almost certainly with the Battalion during 1917 and the following engagements - the First and Third Battles of the Scarpe, the Battle of Polygon Wood, the Battle of Broodseinde, the Battle of Poelcapelle, and the First Battle of Passchendaele. The Third Battle of the Scarpe, the last of the Battles of Arras, 1917, which opened on 3 May, was of a similar nature to the operations of 28 and 29 April. The French had planned a heavy attack on Chemin des Dames to take place on the 5th and, in order to distract the attention of the enemy and hold his troops east of Arras, Sir Douglas Haig considerably extended his active front. While the Third and First Armies attacked from Fontaine-les-Croisilles to Fresnoy the Fifth Army was to launch a second attack upon the Hindenburg Line in the neighbourhood of Bullecourt - a total of over 16 miles. Zero hour was timed for 3:45am on 3 May. In these final operations the 4th Division was engaged. The 1st Battalion Hampshires had not been engaged with the enemy after the close of the First Battle of the Scarpe on 14 April. The 14th Division having relieved the 4th Division on 20 April. The First Battle of Passchendaele took place on 12 October 1917 in the Ypres Salient of the Western Front, west of Passchendaele village, during the Third Battle of Ypres. The Allied plan was to capture Passchendaele village. This was based on the incorrect assumption that during the Battle of Poelcappelle, three days previous, the attacking troops had captured the first objective line. In fact, the Allied front line near Passchendaele had hardly changed and the true position of the Allied front line, meant that the planned advance of 1,500 yards (1,400 m) was actually 2,000–2,500 yards (1,800–2,300 m). The assault was directly south of the inter-army boundary between the British Fifth and Second Armies and consequently pitted a collection of formations from both armies against the German Fourth Army. Despite advances on the northern front of the battlefield, the German's retained control of the high ground on Passchendaele Ridge and consequently the attack failed in attaining its principal objective. Although the battle was costly to both sides, the battle was considered a German defensive success. Further British attacks were postponed until the weather improved and communications behind the front had been restored. Following this series of battles the intensity of fighting lessened somewhat although the landscape remained extremely dangerous and day-to-day fighting took a tremendous toll on both sides. Edward was wounded three times in as many months after these 'set' battles, the final wound being received on 10 December. Sadly Edward died from his wound on 1 January 1918. He was aged 25. On 11 January 1918 the Western Gazette reported "The parents of Private E Gatehouse, Silver Street, have been notified that their son has died of wounds received in action. Private E Gatehouse was seriously wounded on December 10th and admitted to a Casualty Clearing Station in France. He was formerly employed by the “Western Chronicle” Office, and, on leaving Yeovil some few years ago, went to Bournemouth, where he was well-known. He was on leave about a month ago. He had twice before been wounded, and the three occasions were all within three months. Great sympathy is expressed with the widow, the bereaved parents and all other relatives. 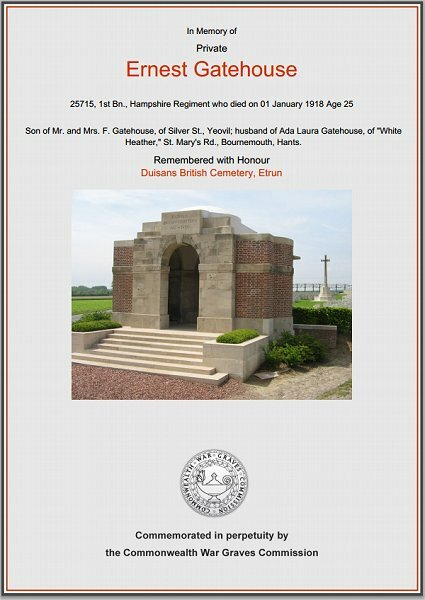 (Husband of Ada Laura Gatehouse, of “White Heather,” St Mary’s Road, Bournmouth)"
Ernest Gatehouse is interred in Grave V.E.8, Duisans British Cemetery, Etrun, Pas de Calais, France and his name is recorded on the War Memorial in the Borough. 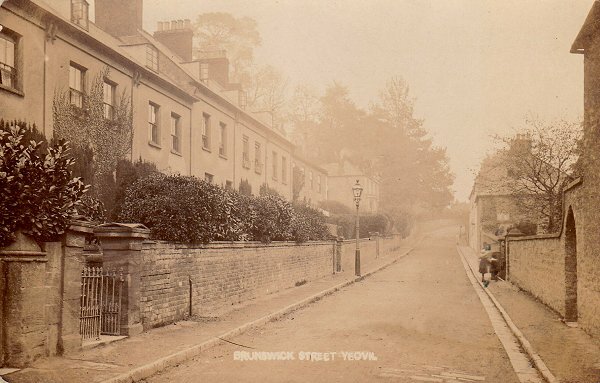 A postcard dated 1906 looking along Brunswick Street at the time the Gatehouse family lived there. Their house would have been further left, just behind the photographer. 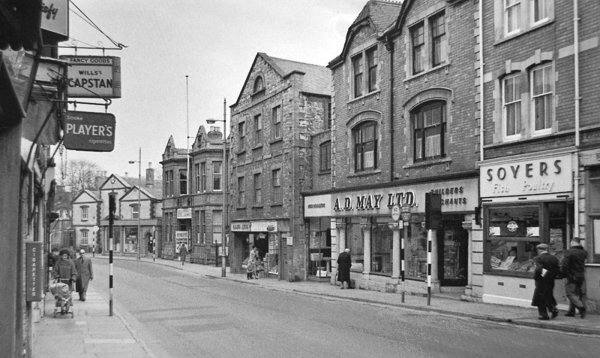 In this photograph of the mid-1960s, the former Western Chronicle building, where Ernest worked before going off to war, is seen at centre sandwiched between the Liberal Club and AD May's builders merchants. The Commonwealth War Graves Commission certificate in memory of Ernest Gatehouse.